If the brake width you require is out of stock please contact us as we can often swap the brake frames for you. Fritschi have been keeping busy with continued development of their pin tech binding the Vipec 12. For the 2017 / 18 season Fritschi are releasing 2 new bindings, the Vipec Evo and the Tecton 12. The Tecton 12 is a completely new addition to the range and is aimed at Freeriders and ski tourers wanting the best in ski performance and safety without compromising the weight. 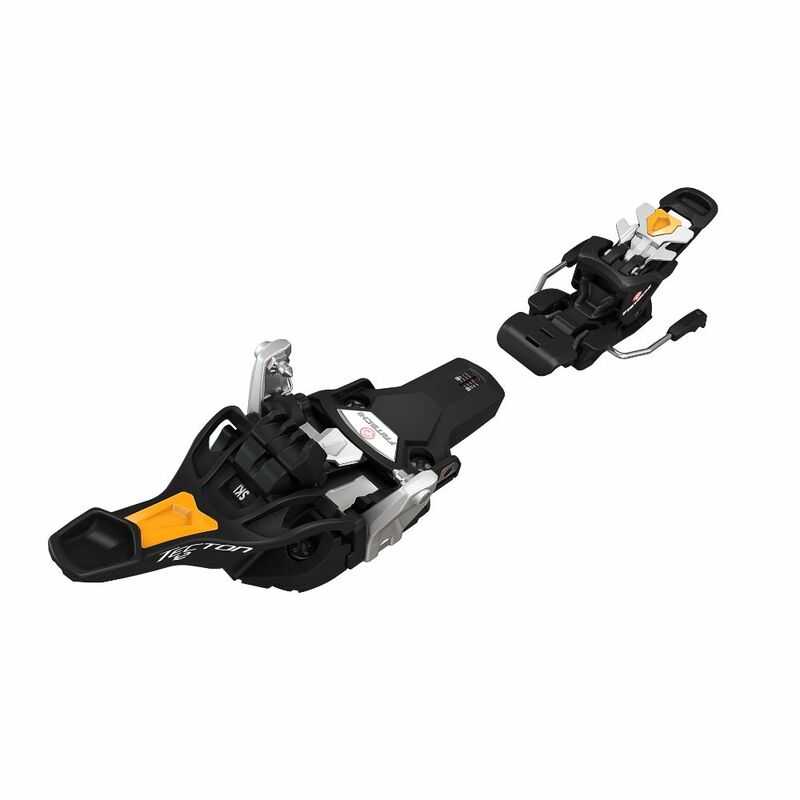 With the Tecton 12, Fritschi have designed an alpine binding style heel piece which gives rock solid ski performance and better safety release characteristics (improved elasticity) than the pin tech heel attachment. This idea was first brought to market by Marker with the Kingpin but the Kinpin is a little heavier (1.5KG) and lacks an adjustable lateral toe release wheras the Tecton 12 weigh 1.2Kg and offer the same adjustable lateral toe release that is found on the Vipec Evo 12. Featuring the same redesigned toe piece as the Vipec Evo 12, the Tecton 12 is much easier to use stepping in than previous Vipec models and they are now amongst the easiest to use pin tech bindings out there. They are also compatible with more boot models and no longer require the colour clip changes for different boot sizes and models. "After 9 days of touring and 2 days Freeride I have had a chance to get a good feel for the Tecton 12 bindings. The first thing I noticed is the dramatic improvement to the ease with which you can step in to the new toe piece design. I could get clipped in first time even on steep slopes and deep snow, this is a huge improvement to the ease of use of these bindings. Once the toe is in you stamp down on the heel and the Tecton heel assembly feels rock solid. There is no play in the binding heel piece and you can really feel the difference when skiing, these feel to me just like the most solid alpine bindings I've used, very impressive for a tech binding. I particularly like the twin rails in the 'power cup' heel piece which engage with the heel tech fitting slots on the back of the boots. Having the elastic range in the heel piece helps make the Tecton feel a bit smoother when you're hammering down difficult terrain. The touring functions work fine, the heel lever pulls upright which frees the boot heel and locks the brakes away, this is easy to do and most importantly it is impossible to get the heel lever position wrong which has lead to people jumping into 'telemark mode' whilst skiing on some of the early models. The toe pivot feels great as you would expect from pin tech and there was no problems with pre release whilst skinning. All in, the Tecton 12 is a real game changer for people wanting to ski hard or on wide skis whilst they are touring without sacrificing safety or weight. A superb binding!" We'll have more in depth reviews and videos of the Tecton 12 coming up soon.